The amazing Spartan Vortex flybarless got smaller, much smaller! At merely 5g, 0.17oz the Vortex Pico is the perfect drop-in replacement for your Blade 180CFX to catapult its performance to another level. Its ultra miniature 31.6 x 19.2 x 7.8mm footprint makes it the ideal choice for any small 180-450 size helicopter. 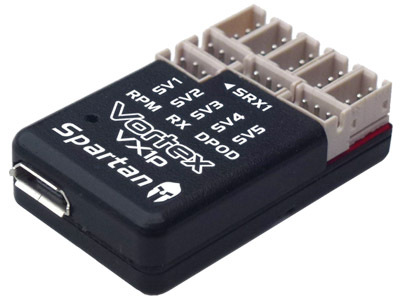 The optional JST to standard servo adapter set allows using the Vortex Pico with standard servos commonly found on Trex 250, Oxy 2, Oxy 3 and similar size helicopters. The Vortex Pico is compatible with all popular radio brands that offer one wire receivers or it can directly use a Spektrum satellite. It features, head and tail stabilisation, governor, flight mode switching, event logging and it is high voltage (8.4V) compatible. The Vortex Pico is guaranteed to spark a new life to your micro helicopter.